My mission is to inspire people to get outside and reap the rewards of adventures in the outdoors. So please inquire about my speaking at your event. 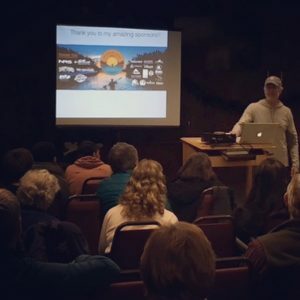 Thank you Maine Outdoor Adventure Club for kicking off my talk series as your guest presenter in December, 2016! Here is my presentations schedule. Please come by if you can! November 16 – Albany/Conway, New Hampshire – Tin Mountain Conservation Center Presentation begins at 7:00pm. A minimal fee is charged to attend and members are free. 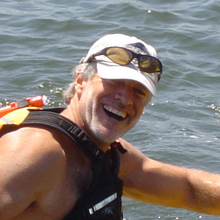 January 5, 2019 – Ipswich, MA – Cape Ann Rowing Club – Presentation and book signing at Riversbend Restaurant, 35 Dodge Street, Ipswich, MA 01929 Meeting is 12:00-3:00pm, presentation and book signing to follow. 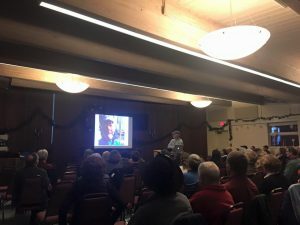 Any chance of a presentation in Bangor, Orono, or UMaine? I would love to give talks in the Bangor/UMO area! I’m working on the book and will then have a more extensive presentations schedule. I will be sure to include your area. Venue contacts are always appreciated! Thanks for visiting with me yesterday at the Shop. In reviewing your fabulous ventures, I wonder if you’d like to do a 2018 presentation in downtown Portland, ME. Yes Harley, I would be delighted!